The living may be easy in the summertime, but the weather often isn’t. During this steamiest of seasons, when the playground seats are hot and the sidewalks are toe scorching, it’s simple to understand why tweens run to the nearest air-conditioned place in front of the television set or video games. But inside the house is no way to spend a summer vacation especially when WATER is an excellent source for cooling-off and is so easy and accessible. So, whether you have an in-ground swimming pool or just a large wading pool; your kids can spend hours of fun and “beat the heat” this summer. What’s Cool in the Pool? 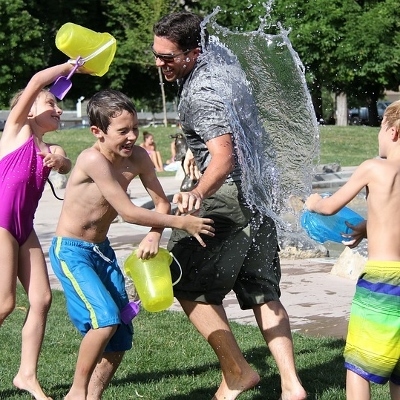 These wet and wild games are awesome to play with some friends on the hottest of days. Everyone lines up inside the pool near the shallow part. Give each child a dry sheet of newspaper (you could also use paper towels). On cue, everyone starts swimming making sure to hold the paper above and away from the water. The child who can get the paper to the other end of the pool and keep it dry wins this game. The object of this contest is to race to the far end of the pool while pushing a balloon with your nose. For each swimmer fill a balloon with about ¼ cup of water, then blow it up the rest of the way and knot it. The water will weigh down the balloon enough so that it will float atop the water without blowing away. Choose an area outside on a bright sunny day. Give your tweens ice cubes. Tell them to find a place where they think the ice cubes will last a long time. Have them hide them in different places outdoors. Check the cubes periodically and discuss why some melt faster than others. The key to winning an ice boat race is to outlast the competition. On a steamy day, launch these boats in a wading pool and see whose melts last. To make an iceboat, you’ll need a pint size juice carton, food coloring, duct tape, a 12” wooden dowel, colored cellophane, and a stapler. Fill the carton with 1-½ cups of water and several drops of food coloring. Cover the top with heavy-duty tape. Make sure to shake it to disperse the color. Place the carton with its side facing up and cut an X through the center of this side. Make sure an adult does the cutting part. Thread a dowel into the hole and place the carton into the freezer to harden overnight. Next cut out a cellophane sail (8” high by 7” across the base and 11” along the diagonal). Fold the 8” side ¾ inch in from the edge and staple this along the fold. Finally cut the carton away from the frozen boat and slip the sail onto the dowel mast. Now, you are ready to launch the boat. Happy sailing!